Alan Davidson, the author of Oxford Companion to Food, expresses his doubts. Culinary mythology--origin of the croissant According to one of a group of similar legends, which vary only in detail, a baker of the 17th century, working through the night at a time when his city (either Vienna in 1683 or Budapest in 1686) was under siege by the Turks, heard faint underground rumbling sounds which, on investigation, proved to be caused by a Turkish attempt to invade the city by tunnelling under the walls. The tunnel was blown up. The baker asked no reward other than the exclusive right to bake crescent-shaped pastries commemorating the incident, the crescent being the symbol of Islam. He was duly rewarded in this way, and the croissant was born. The story seems to owe its origin, or at least its wide diffusion, to Alfred Gottschalk, who wrote about the croissant for the first edition of the Larousse Gastronomique  and there gave the legend in the Turkish attack on Budapest in 1686 version; but on the history of food, opted for the 'siege of Vienna in 1683' version." In a mixer with a dough hook, place the yeast, flour, sugar, salt and the milk and mix for 2 minutes until a soft moist dough forms on the hook. If the dough is not moist, add more milk, half tablespoon at a time until it is moist and smooth, using not more than 2 tablespoons. Increase speed and mix until the dough is very smooth and elastic, about 2-3 minutes. Cover the dough and rest for 30 minutes in fridge. Roll the dough on a lightly floured board to a 9 by 16 inch rectangle. Soften the butter by beating with a rolling pin. Place the butter over two-thirds of the length of the rectangle. Starting from the the unbuttered third, fold the dough, like a business letter, into thirds. Turn the dough a quarter degree, so that the open sides are at 12 and 6 o'clock. Roll again the laminated dough to a rectangle and fold into thirds. Wrap the dough with plastic film tightly and chill over night to ease the gluten. Remove from the fridge and perform the 3-fold three more times. Or two more times of 3-fold and a 4-fold turn for the final, which is to fold both ends into the center and then fold to close, like a book. Chill for 30 minutes to relax the dough between each turn. After the completion of the final turn, relax the dough in the fridge for 2 hours or overnight to fit your schedule. At this point the dough can be frozen until needed. Thaw the dough overnight in the fridge before shaping. On a lightly floured surface, roll out the dough to a rectangle with about 4mm in thickness. Trim irregularities and divide the dough with a pizza cutter or knife (using croissant cutter if available) into triangles, about 4-inch wide, or wider if you prefer croissants more curved. Gently stretch the base of the triangle to widen it slightly, while one hand holds the base, pull the dough with the other to lengthen the dough, so that a quality croissant with multi layers. Roll up starting at the wide bottom to make a curved cresent shape and place them on a baking paper lined pan. To proof the croissants, place them in an oven that is warm but not turned on, with a pan of hot water in the bottom to create a moist environment, which is beneficial to the proofing. Let rise until croissants puffed up and spongy to the touch, 2-3 hours. Remove from the oven. Preheat the oven to 200F/400F. Mix egg and milk together in a bowl. Brush with the egg wash and bake the croissants for 22 to 25 minutes until golden brown. Allow them to cool on a rack before serving. Avocado Pear or Alligator Pear or Butter Pear...They all mean the same kind of fruit (or vegetable? ), which is a tree native to Mexico and Central America. Avocado is rich in unsaturated fat, and B E K vitamins. It has highest fiber content of any kind of fruit. Although avocado is such a value to the human being, it is poisonous to the animals. So keep your pets away from avocado! Check here for more information about Avocado and Weight Loss. Cut the avocados in half lengthwise and remove the core. Carefully remove the flesh and cut each half into five or six slices. Keep two avocado shells intact and reserve. Rinse chicken breast under cold running water. Pat them dry with paper towel and shred. Place chicken shreds into a bowl, marinate with soya, chicken bouillon and egg white for 30 minutes. Add in cornstarch and combine well. Heat up a skillet with some oil. Blanch the marinated chicken shreds until cooked. Reserve one tablespoon of oil in the skillet and stir fry ginger, scallion and garlic until fragrant. Add in sweet peppers and return the chicken to the skillet. Drizzle in the rice wine, season with salt and pepper. Stir briefly. Add in avocado slices and toss to combine. Remove and place them into two reserved avocado shells. Sieve the flour and salt. Rub in butter and make a well in the center. Fill in water and lemon juice, and mix well into a smooth dough ball. Wrap tightly and relax the dough in the fridge for 30 minutes. Cut a cross on the top of the dough and pull out four corners to form a star shape. Roll out the points of the star into flaps, keeping the center thicker. The total thickness of four points is about the thickness of the center dough. Knead the butter between two baking paper to the same texture as the dough. This is extremely important. As the fat will melt and then ooze out if too soft, if too hard it will break through when rolling. Place the butter on the center and fold to seal in butter and press out any air. Make sure no butter is exposed. On a lightly floured work surface, flatten the dough with a rolling pin, and then roll out to a 7x21-inch rectangle. Fold the bottom third of the rectangle up toward the centre, and brush off any extra flour. Fold the top third down to make a neat square and brush off any flour. This is a single fold. This folding method is similar to folding a letter into thirds to fit into an envelope. Give the dough a 90 degree turn to the left and again roll it out to a 7x21-inch rectangle. Fold in both the edges so that they meet in the center. This is called a double or book fold. Wrap and chill the dough overnight or at least 45 minutes. To get the maximum rising, turn the dough in the same direction so the the seam is always at the same side. Remove the dough from the refrigerator. Repeat both the single and double folds. Although the dough at this point is ready for use, allow to rest for two hours after the final turn before using in recipes. Alternatively freeze it for up to two months. If a recipe calls for a lighter pastry, then repeat the single and double folds again. In this case, relax the dough just for one hour. Beat all the ingredients for the filling until well-blended. Strain the filling through a strainer. Set aside. Preheat the oven to 200C/400F. Roll out the pastry dough into 3mm thickness and cut out 18 circles with a round cookie cutter and press into tart pans. Spoon the mixture evenly into the pastry cases, leaving about 1 cm below the rim of the pastry, and if desired sprinkle the top with coconut flakes or sesame seeds. Bake for about 20 minutes until golden. Place the starter, water and flour in a mixing bowl. Stir for a minute at low speed. Allow it to rest for 20 minutes. Add salt in and knead for about 7 minutes to form a firm but slightly sticky dough. Place in a lightly oiled bowl and cover. Let proof for 45 minutes. Remove the dough from the bowl and place it on a lightly-floured surface, gently pat down flat and fold like an envelope, all four sides being brought over the center of the dough. Return the dough into the bowl, cover and let ferment for another 45 minutes. Pat down, fold and round up. Place the dough back in the bowl, cover with a plastic wrap and let ferment for 35 minutes. Divide the dough into 3 equal portions. Shape each into a baguette by stretching each dough into a rectangles, then folding the bottom and top thirds to the center, pinching the seam together and allowing them to rest for 10 minutes. Fold the dough over lengthwise and press the ends together. Roll each dough back and forth to elongate it to the desired length and taper the ends. Use perforated baguette pans if available, otherwise place the shaped dough either in the floured folds of a large linen, or a baking sheet dusted with flour. Cover and let rise until slightly under proofed, about 35 minutes. Place a shallow pan in the bottom of the oven and start preheating to 250C/500F. Use tiles or stones on the oven rack. Using a razor knife, make 2-3 shallow slashes across top of loaves and slide the loaves onto the heated baking stone. Pour a cup of very hot water into the water pan. Close the door and bake for 12 minutes. Lower the temperature to 200CT/400F and continue baking the loaves until golden, about 22-25 minutes. Cool them on a rack. Mapo Tofu / 麻婆豆腐 is a popular Chinese dish from the Szechuan province. 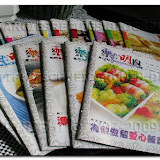 It is a combination of tofu dices, and ground meat, beef or pork, in a hot bean-based sauce. Best served with white rice. Poach the tofu in a pan of simmering water for 3 minutes. Remove from boiling water and drain. Heat a wok or large heavy skillet over high heat until hot and add oil, swirling to coat. Add pork and stir-fry, breaking up lumps, until no longer pink. Add garlic and ginger and stir-fry over moderate heat until very fragrant, about 2 minutes. Add the salted black beans. Mash the beans with a cooking ladle until they blend in well with the meat. Add bean paste and continue stiring, then the stock, soya sauce and bean curd. Stir cornstarch mixture and add to stir-fry. Bring to a boil, stirring gently, and cook until thickened and glossy, about 15 seconds. Turn off heat and sprinkle with chili oil, Szechuan chili powder, to taste, and half scallion. Stir once or twice, then serve sprinkled with remaining scallion. Serve hot accompanied with cooked white rice. Pour the hot water into the wheat starch. Mix to form a thick paste. Add in glutinous rice powder, sugar and spinach juice. Stir until a smooth dough forms. Then add the shortening and knead until the dough smooth. 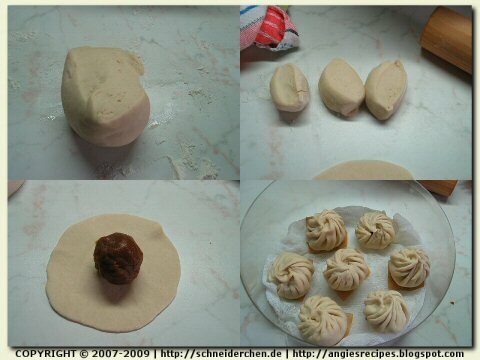 Divide the dough into 25 portions, each about 20 grams. Divide bean paste into 25 portions. Flatten each piece of dough. Place a portion of filling in the middle and gather edges of skin to enclose filling. Pinch to seal. Heat oil and deep fry rice balls over medium heat for 5 minutes until they float to the top. Christolle, created in Dresden in around 1450, is one of the delicious, traditional German specialities in X'mas season. The Stollen is traditional baked only with flour, yeast, water and oil. Butter and spices were strickly forbidden to be used during the holy ADVENT, which is also the season of fasting, according to the church and pope at the time. Modern Stolle is full of butter, spices, raisins, almonds, and dried fruit. The shape of Stollen symbolize the baby Jesus wrapped in swaddling clothes. Soak the currants in the warm water for 30 minutes. Drained and set aside. Dissolve yeast in the warm milk and leave it for 5 minutes. Then add in sugar, salt and egg. In a bowl, combine the flour and cinnamon, then sieve into the milk mixture. Beat until smooth dough is formed. Knead in butter until elastic and smooth. Add in candied fruit and nuts knead until well blended. Put the dough mixture in a lightly greased plastic bag, and let rise for about 1 hour on a warm draft free spot or until double in bulk. Punch dough down and place on well floured board. Divide dough into 2 equal portions and form each to an oval shape. Fold one long side 3/4 way over toward other long side and gently press together to make a loaf. Place each on a greased baking sheet, let rise in a warm place until doubled in bulk. Bake in preheated 160C/320F oven for about 30 minutes, until golden brown. Brush tops with melted butter. Dust with confectioners' sugar. The filling I used here is called Xianglian(or Hsianglien)湘莲 from Hunan Province in China. Hunan is called 湘 Xiang for short, after the Xiang River which runs through the province. Place the yeast and water in a small bowl. stir, and let mixture stand 10 minutes to dissolve. Mix together flour，baking powder and sugar. Add in the yeast mixture. Mix until dough forms a rough ball. Remove dough to a lightly floured board. Knead, dusting with flour until dough is smooth and elastic. Let rise until it doubles in size, about 50 minutes. Punch down dough and divide dough in half. (one half I use for making 5 spring onion buns). Roll the other half into a long roll and cut into 5-7 pieces. Roll each of pieces into a circle. The center of circle is suppose to be a little bit thicker than the sides. Set on a 2-3-inch square of parchment paper and place in a steaming basket. Leave space between buns in the basket. Let rise for 30 minutes, or until buns almost double in size, then steam over boiling water and high heat for 12 minutes. When done, leave them in the steamer for 5 minute before serving.